Drinking chocolate, made with 68 percent Dominican Republic dark chocolate. Fran’s coffee program goes unadvertised. The company leads with the chocolate—the crunch bars, truffles, and gray and smoked salt caramels that have been touted by everyone from Bobby Flay to Barack Obama. And with three tables and no wifi at Fran's University Village location, it isn’t the kind of place to park your laptop. (For that, there will soon be a stylish new Mr. West outpost, with its morning, noon, and night menu). But U Village denizens know the Fran's location facing the huge new Apple store is also home to a great coffee program (full Caffe Vita espresso service, but no drip); tea service from Vancouver-based Tealeaves; and three specialty drinks: dark drinking chocolate, Fran’s mocha, and Fran’s matcha. Forget wandering around with a venti; at Fran’s, the standard drink size is eight ounces and best enjoyed in-house from smooth, handleless mugs akin to Japanese tea bowls (though you can take your drinks to-go). There’s also the perk of being plied with chocolate as soon as you step through the door. 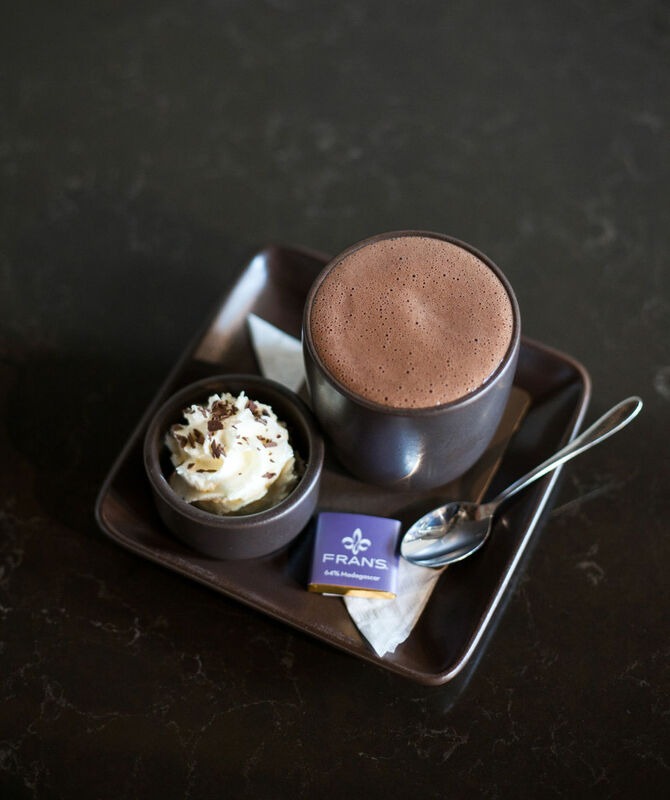 According to business director Kathleen Eder, coffee has been a store staple since Fran Bigelow first opened the doors of her patisserie in 1982: “She really liked a little espresso to go with the dessert.” The coffee program also reflects Fran's expanding interests. While France informed the chocolaterie's origins, Japan inspires more recent endeavors, like chabako gift boxes, ikebana classes, and the new Fran's location in a Japanese airport (the sole Fran's outside Washington state). And, now on the drink menu, Fran's matcha. The green tea latte originated at “Senses from Japan,” an annual event hosted by Fran’s, Tealeaves, and the Japanese antique dealer next to Fran's Georgetown headquarters. During a tea ceremony, they paired matcha tea with white chocolate truffles. Bigelow thought the flavors belonged in the same mouthful. You can find coffee at all four Fran's locations in Seattle, but Fran's time-slowing elegance stands out at U Village—it's the perfect antidote to mall fatigue and an appealing alternative for those looking to branch out from Starbucks.